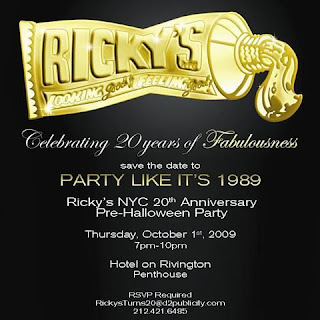 Right after the Spa Week Media Party, I headed down to Ricky's NYC 20th Anniversary / Pre-Halloween Party at Hotel Rivington. It was crowded so I didn't stay that long but definitely worth checking out and seeing people in costume. If you are not familiar with Ricky's, they carry everything beauty - hair care, cosmetics, unique fashion accessories - you name it. I ended up with more beauty products at the end of the night, with an incredible swag bag from Ricky's including stellar products from Warren Tricomi, Murad, Peter Thomas Roth, Mattese Elite and fun Temptu temporary tattoos, mini Ugly Doll and more.